Previously, Ellis — who began commercially selling the tea in 2008 — had been making the 3.5-hour trek to Hart in Oceana County on the west side of the state about twice a year. There, she would rent commercial kitchen space through the Starting Block, an incubator and entrepreneurial center for startup food resource businesses. “I would go two weeks at a time and brew enough to hold me over for a few months (4,000 to 6,000 bottles),” says Ellis, founder of Ellis Infinity, which produces, distributes, and markets the beverage. Ellis also hopes to provide co-packing services for other beverage companies in the area. “Co-packers come few and far between, so many of the beverage companies that have co-packers have to go far to find someone to fill their products. So I want to start by working with local companies,” she says. 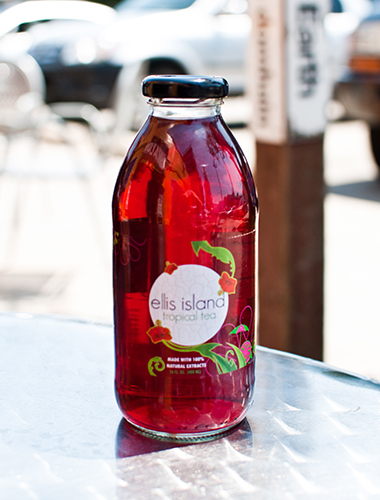 Ellis offers a sweetened and unsweetened version of the tropical tea, which is based on a recipe developed by her great-grandfather Cyril Byron, a Jamaican immigrant who was master chef for the Black Star Line cruise line. Ellis says the company will expand to include other flavors. IN OTHER EASTERN MARKET NEWS, the enclave recently added the Sunday Street Market to its schedule. From June 1 to Sept. 28, vendors will begin selling non-food goods such as jewelry and art work in Shed 2, with weekly entertainment activities taking place in Shed 3. On Tuesday, volunteers from Eastern Market and Bank of America will begin to spruce up the facility in preparation for the 48th Annual Flower Day on May 18, which attracts more than 200,000 people. For more information, visit detroiteasternmarket.com.